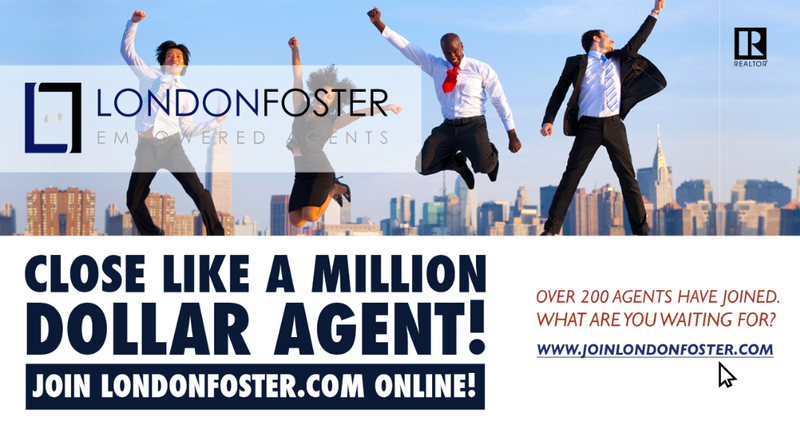 In addition to the 100% Commission payout for all associates, London Foster has released LF Agent 2.0 (available on Android app store) as a fully functional mobile office solution for realtors on the move. This unique platform sets itself apart from other 100% commission firms. Were most just require managing transactions by email or some 3 rd party that developed general functions, this platform is “bespoke” to the power associates and the way they do business k tailored to the realtor. It gives all of the solutions usually done at the office but at your fingertips. Most 100 percent real estate firms do not offer the technology like this so its interesting to see a 100% commission real estate office offer something that the bigger companies offer without paying the hefty price. 100% real estate offices are becoming more attractive to realtors from “big box” companies that take upwards of 30-50% after the Monthly fee, franchise fee, technology fee and the percentage split. “We see a lot of professionals finally pull the trigger and come aboard after realizing the savings especially as this profession becomes more and more competitive” says London Foster Broker Bobby Mahallati. “London Foster is one of South Florida’s fastest growing 100% real estate firms and is expanding to Georgia, Pennsylvania, New Jersey and New York.” Transactional fee based firms like these are sometimes looked down upon due to the immediate disruptive nature it has to the “old school” way real estate has been and currently still operates. Because of new technology available, most companies will use it to lower costs but then pass the profits to themselves, Transaction based firms like London Foster pass the savings on to the realtor, hence their tagline “Empowered Agents”. London Foster says their Vision is to give the customer the best real estate experience by empowering the realtor with higher payouts and turning their realtors into marketing machines. “As a marketer, realtors need to realize their profession, they are marketers first, then realtors.” Said Vasile Turcan, London Foster’s marketing director who oversees the companies digital and social media marketing efforts.